It’s the season of gratitude, y’all! Personally, this year has been filled with some of the higher highs and some of the lower lows in my life. And you know what? I am grateful for each and every experience. While it can be hard to find gratitude during the low times, it is essential. When we are going through something tough, it is important to dig deep and discover that lessons that it was brought here to teach us. These are the times that can define us, and we choose whether it defines us positively or negatively. These are our opportunities to find true GROWTH, to become a stronger, wiser, more resilient person. One essential lesson I have learned time and time again is COMPASSION - for myself, for other living beings, and for Mother Earth. One of the best ways that we can express our gratitude to Mother Earth this Thanksgiving is by eating a vegan dinner! Not only will you avoid the aftermath of the traditional Thanksgiving fare (you know - GAS, bloating, heartburn, and having to unbutton your pants (OK, maybe you’ll still need to do that)), but you will also be taking part in saving at least one of 46 MILLION turkeys killed for Thanksgiving dinner. Crazy, right? So, cheers you and cheers to a Thanksgiving of compassion, gratitude, and kindness towards all living beings, all while still getting to eat, drink, and be merry! 2. Cut Squash in half lengthwise. Flesh side up, brush with topping of choice, I like to go half and half, doing one side savory and the over side sweet. 3. Place flesh side down on roasting pan and bake for 45 minutes- 1 hour. You know your squash is done when you can pierce a fork all the way through the squash. 4. Stuff squash with stuffing and enjoy! 1. Prepare quinoa by heating 2 cups of water with 1 cup quinoa until boiling, then lower heat and cover for 7-8 minutes or until all water is absorbed into quinoa, fluff with fork. 2. Once quinoa is done, mix in all other ingredients, then stuff your baked squash! 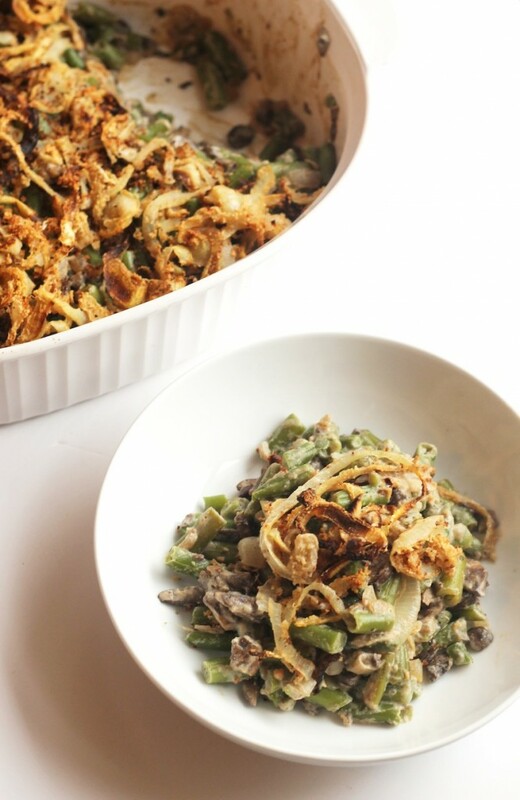 This ultra creamy whole foods version of the classic green bean casserole tastes so decadent that you'll never guess it's dairy and guilt-free! Vegan and gluten-free. 1. Meanwhile, preheat oven to 475F. 3. Thinly slice two of the onions, setting aside the other onion for later. Combined sliced onions with bread crumbs, flour and ¾ tsp salt in a large bowl, tossing to combine. Be sure to separate each individual onion piece. 4. Spread onions in an even layer on a baking sheet sprayed with cooking spray or lined with a Silipat. Spray once again with cooking spray. Bake for 20-25 minutes, tossing halfway through. Watch carefully to make sure they don't burn towards the end of cooking. Once onions are done, remove from oven and lower oven heat to 350F for casserole. 5. Bring a large pot with two inches of water to a boil. Once boiling add green beans. Bring back to a boil (this may take a while) and cook over medium heat for about 5 minutes, or until tender. Drain and run cold water over green beans to stop cooking. Set aside. 6. In a large skillet, heat olive oil over medium heat. Chop remaining onion. Once hot, ad to pan and cook for about five minutes before adding garlic and mushrooms. Cook for another ten minutes, stirring often. Add nutmeg, soy sauce, white wine, 1½ tsp salt, and pepper. (It will taste salty, that's ok!). Simmer for about five minutes. 7. Blend soaked cashews with almond milk in a blender or food processor (I used my nutribullet) until completely smooth and creamy. Set aside. Stir in cashew cream and ¼ of the baked onions. Stir in cooked green beans. 8. Spread mixture into a large casserole dish. Top with remaining baked onions. Bake at 350F for 20 minutes (if onions are on the crispier side, you can cover with foil for first half of cooking.) Serve hot! *** To make this dish ahead of time, make the sauce and the green beans then store in separate containers in the fridge. The next day, bake the onions and combine everything per the recipe. This is a low-sugar, gluten-free, and vegan recipe that is incredible! You won't miss all the sugar and butter in this flavorful casserole that is a perfect Thanksgiving dinner recipe. 1. Preheat your oven to 400 degrees. Pierce the sweet potatoes with a fork and place them on a rimmed baking sheet. Bake them in the oven until they are very soft, 60-90 minutes, depending on their size. Turn the potatoes over once during the baking time. 2. When the sweet potatoes are finished cooking, allow them to cool. Once they are cool, use a knife to cut open the skin and peel it out. Discard. Put the sweet potato flesh into a large bowl and mash well. Add the next 8 ingredients (through orange zest, if using) and mix well. Place the sweet potato mixture in a 2-quart baking dish. 3. In a small bowl, mix together the pecans, coconut oil, maple syrup, and cinnamon. Place the pecans on top of the casserole as shown in the pictures. 4. Reduce the oven temperature to 350 degrees and bake for 20-25 minutes, until the top is lightly browned. Enjoy! These vegan mashed potatoes are made with cashew cream for the ultimate creamy texture. With roasted garlic and crispy shallots, these can’t be beat! 1. Boil the cup of water, then combine with the cashews. Let sit 30 minutes. 2. Bring a large pot of water to a boil. Peel the potatoes if you’d like (I prefer not to), then chop into 1/2″ pieces. Boil for about 20 minutes, until easily pierced with a fork. 3. While the potatoes boil, place 4 unpeeled garlic cloves in a heavy, dry skillet. Turn heat to medium-high and cook, turning every every now and then, for about 15 minutes, until they have brown spots on all sides. Let cool, then remove the skins and trim the ends. 4. Also while the potatoes boil, peel the shallot and mince finely. Heat the olive oil in a small skillet and add the shallots. Cook, stirring constantly, until golden brown and crispy. Remove from the heat. 5. To make the cashew cream, add the cashews and their soaking water to a blender along with the roasted garlic cloves. Blend until smooth, 1-3 minutes depending on your blender. It’s best to let the blender stop and cool down every minute or so. 6. When the potatoes are done cooking, drain. Add to the bowl of your stand mixer and fit with the whisk attachment. Alternatively, add to a large wide bowl and use a potato masher. Add the cashew cream with roasted garlic, the butter, and the salt. Beat for about 5 minutes for slightly lumpy potatoes, and up to 10 minutes for smooth potatoes. Serve topped with the crispy shallots, and enjoy! *** If your skillet is large, you may need to use more olive oil. You want plenty in there for the shallots to cook in, otherwise they may burn instead of brown. This salad is to die for. It’s literally SO good! Plus, if you're a fan of leftovers the beet and carrot part of the salad will hold up beautifully after a day or two. 2. Cut the top quarter off the head of garlic and drizzle with ½ tablespoon olive oil. Wrap it in foil and set it in a small oven-proof dish. Bake it for 20 minutes. Remove it from the oven and keep it wrapped to cool. It will continue to cook as it cools. 3. Turn the oven up to 425 degrees. 4. While the garlic roasts bring a pot of water to a boil. Blanch the carrots in the boiling water for 2 minutes. Then add the beets and boil for 8 to 10 minutes. Remove them with a slotted spoon and run under cold water. At this point, the skins should easily peel off the beets by using your finger. Use a peeler if needed for tougher skins. 5. Halve the carrots and quarter the beets. Arrange them on a baking sheet. Drizzle with 1 tablespoon olive oil and sprinkle with salt. Roast for 20 minutes, flipping vegetables halfway through. 6. Arrange the chard on another baking sheet. Drizzle with ½ tablespoon oil and pinch of salt, and rub it all over the leaves. Roast for 5 minutes, or just until the leaves have softened and become slightly browned. 7. Next make the dressing. Squeeze the roasted garlic out of its papery skin and into a small mixing bowl. Mix in lemon juice and add a pinch of salt. Next, whisk in the remaining 3 tablespoons olive oil and combine until smooth. 8. Toast the pepitas in a small skillet over medium heat. Cook, while flipping almost constantly for 2 minutes or until they start to pop. Sprinkle with salt. The Minimalist Baker is like my vegan cooking GURU. She’s amazing. This easy, 8 ingredient vegan apple pie with has subtle pumpkin flavor from both pumpkin pie spice and pumpkin butter (or puree). This is the perfect way to complete this vegan Thanksgiving. Also, make sure to checkout her VEGAN PUMPKIN MINI CHEESECAKES. Maybe even make both this year! 1. Preheat oven to 400 degrees F (204 C) and place a rack in the bottom 1/3 of your oven for optimal baking. 2. Prepare filling by peeling and slicing apples into bite sized pieces or slices and tossing with cinnamon, pumpkin pie spice, salt, sugar, pumpkin butter, and unbleached flour. Set aside. 3. To prepare crust, whisk flour, salt, pumpkin pie spice and cinnamon in a large bowl. Then add cold butter and use a pastry cutter or fork to combine until crumbly. 4. Add ice water 1 Tbsp at a time until a loose dough forms. 5. Transfer to a floured surface and gently mold together with hands, handling as little as possible. Divide in two, making one (the bottom crust) slightly larger. 6. Gently roll out the larger crust using only as much flour as needed, and carefully drape over a standard pie pan (mine is 9.5 inches) using a rolling pin to help transfer. Leave the edges hanging over and only trim areas of great excess and add those back to the other crust. 7. Add the apple filling, reserving most of the excess liquid that's formed, and then roll out the other crust. 8. You can cut the crust into strips and do a lattice top (tutorial here), or just lay the whole crust over the apples for a traditional top, in which case you’ll need to poke several little holes with a knife to let steam escape. 9. Use your fingers to crimp edges and then brush the pie with lightly water or dairy-free milk and dust generously with sugar. 10. Bake for 45-50 minutes or until golden brown. Cover the edges with foil at the 30-minute mark so they don’t get too brown. 11. Let cool completely before slicing or the filling will run - at least 3-4 hours. Best when fresh, but will keep for up to a few days. Serve with coconut whipped cream or your favorite non-dairy ice cream! *You can either make your own pumpkin butter - I love this recipe from Oh She Glows - or buy it at the store. Just be sure to check the ingredients, as some are sweetened with honey. *Find some helpful pie crust tips here! *For a crumble top pie, halve the pie recipe to just make a bottom crust and then top with this crumble recipe. Thank you so much for taking the time to read this blog, I am SO GRATEFUL for you! I would love to hear how these recipes went for you, so please leave a comment in the comments section or send me an e-mail to kellycollinswellness@gmail.com! Also, make sure to checkout my video 5 Yoga Poses To Do After Your Thanksgiving Meal to help you reenergize and speed up digestion after your big, delicious, vegan meal! Lokah Samastah Sukhino Bhavantu - May all being be happy and free.